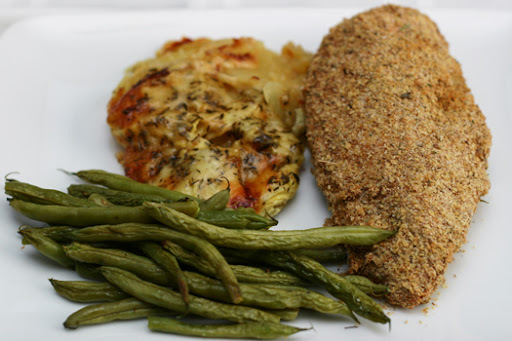 I decided to take a chance and combine a few recipes to see if I could come up with a good coating for baked chicken. I wanted something that stayed nice and crisp on the the outside, held together well, and had a nice flavor. I think the combination of these two recipes worked out really well, and accomplished was I was looking for: crisp, intact coating. It's a very versatile technique, as the breading layer can be spiced any number of ways: spicy with chili powder, a simple Italian blend, even a simple garlic/onion/parmesan cheese as the original recipe. I simply chose some Herbs de Provence, which went really well with the potato gratin. Inspired by Everyday Food Magazine, here and here. Combine egg whites, cornstarch, salt and pepper in a medium bowl. Whisk to combine thoroughly. 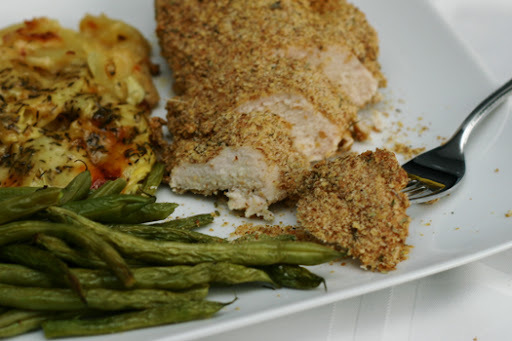 Combine wheat germ, breadcrumbs, flax seed and seasoning in a shallow dish. Dip chicken in egg whites, then in breading mixtures. Shake off excess breading and place on a baking sheet fitted with a rack (to keep chicken elevated when cooking). Lining the baking sheet with foil is optional for easy cleanup. Bake chicken at 400 degrees until center of thickest part registers 165 on an instant read thermometer. It seems the only way to get yukon gold potatoes in this town is to buy the giant bag of them. I much prefer to buy potatoes loose, because we eat them so infrequently. For one meal that includes some mashed potatoes, it's hard to have to buy the whole stinkin' bag, then try to figure out how to use up all the rest. This time, I not only had potatoes to use, but leftover cheese sauce and shredded gruyere from the fabulous croque monsieur. Well, today I decided I never have to worry about too many yukon gold potatoes ever again. My husband and I both loved this dish to pieces. Next time mashed potatoes are on the menu, that giant bag of potatoes will happily go in my cart with a block of gruyere! I made individual gratins in 16 oz ramekins, but this could easily be combined into a larger casserole dish if desired. Spray four 16 ounce ramekins with nonstick cooking spray. Starting with the first ramekin, place a layer of potato slices in the bottom. Top with 1/8th of the artichoke quarters. 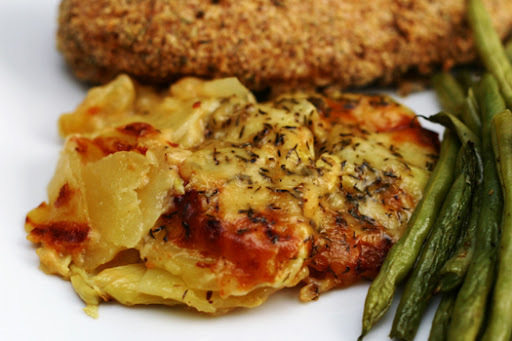 Layer with 3 tablespoons cheese sauce, 1/8 teaspoon thyme, and a dash of salt and pepper. Repeat layers, then top with 1 tablespoon parmesan. Repeat for remaining three ramekins. Bake at 400 degrees for about 45 minutes. Cover with foil if cheese is getting too brown. Melt the butter over low heat in a small saucepan and add the flour all at once, stirring with a wooden spoon for 2 minutes. Slowly pour the hot milk into the butter–flour mixture and cook, whisking constantly, until the sauce is thickened. Off the heat add the salt, pepper, nutmeg, and gruyere. 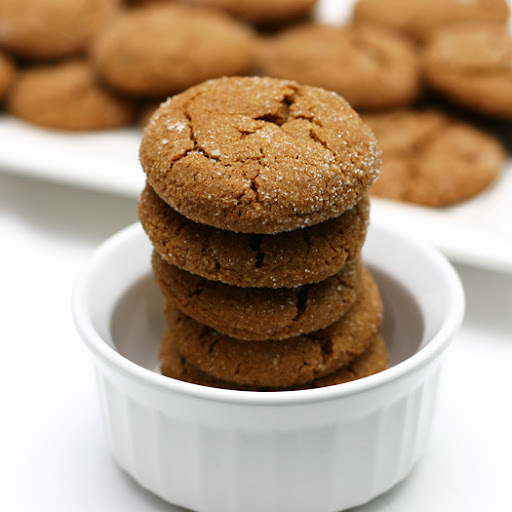 Recently I've seen a few good recipes calling for molasses, which is something I've not yet worked with. Unfortunately I couldn't find it at my normal grocery store, but a trip to another store last weekend was successful! 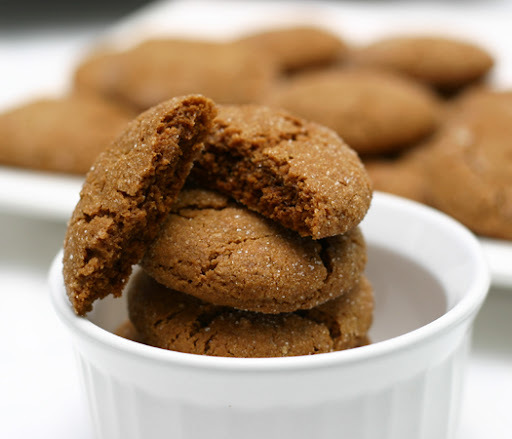 I turned to all my recipe sources (excel spreadsheet, Google Reader, bookmarks), and found Katie's pictures of molasses spice cookies. All it took was one look! I couldn't resist. I had to make them. Oh my goodness. I can see why these would be a fall favorite. They smell fantastic while baking up! They were pretty easy to throw together, though rolling them up is more time consuming than a regular scoop'n'go cookie recipe. I disliked that I could only bake one sheet at a time, especially as I happened to make a double batch of these. It took quite a while to get them all done. In the end, the taste and texture made it all worth it. Perfectly crisp outside, encasing a perfectly soft interior. And how can you resist the crackled top?! Delicious. 1. Adjust oven rack to middle position and preheat oven to 375 degrees. Line large baking sheet with parchment paper or spray with cooking spray. 2. Whisk flour, baking soda, spices, and salt in a medium bowl until thoroughly combined; set aside. 3. 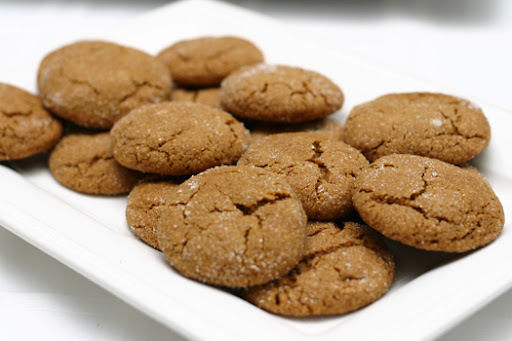 Either by hand or with electric mixer, beat the butter with brown sugar and 1/3 cup granulated sugar at medium high speed until light and fluffy (about 3 min.) Reduce speed to medium low and add yolk and vanilla, increase speed and beat until incorporated (about 20 seconds). Reduce speed and add molasses beat until fully incorporated, about 30 seconds, scraping the bottom and sides once with rubber spatula. Reduce speed to lowest setting and add flour mixture and beat until just incorporated, scraping the bowl once. Give the dough a final stir by hand to ensure no flour pockets at bottom. The dough will be soft. 4. Place 1/2 cup sugar in shallow bowl for rolling. Fill small bowl with cold tap water. Dip hands in water and roll heaping tablespoon of dough into 1 1/4 to 1 1/2 in ball; drop ball in sugar and roll to coat. Set on prepared baking sheet at least 2 inches apart. 5. Bake,ONE sheet at a time, until the cookies are browned, still puffy, and the edges have begun to set, but the centers are still soft (the cookies will look raw between the cracks and seem underdone), about 11 minutes. Do not over-bake. 6. Cool on baking sheet for 5 minutes, then transfer to a wire rack; cool the cookies to room temperature. 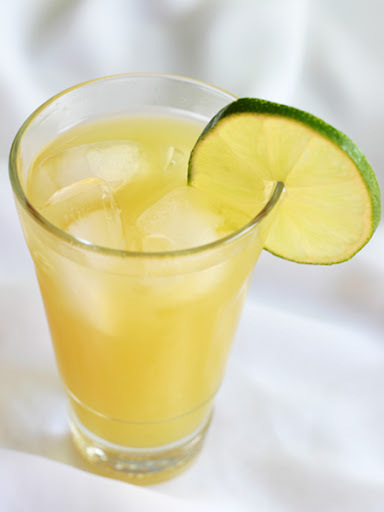 A refreshing drink, great for the start of spring and summer weather. Enjoy! Combine in a large pitcher, chill and serve over ice. Garnish with lime slice. I have to admit, upon reading the title of the second Barefoot Bloggers recipe for April, I had noooo idea what it was. The lack of a photo was not helping my cause. 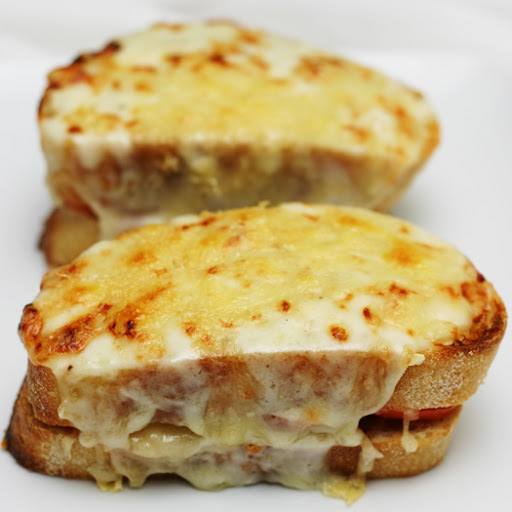 A simple read through the directions revealed that croque monsieur is simply the devil, in ham-and-oh-so-much-cheese-sandwich form. Given we are a no ham house-sold, I decided these would have to be glorified grilled cheese sandwiches with tomato. YUM. This definitely falls under the category of "decadent." Let's see: bread, layered with cheese, layered with more bread, slathered with cheese sauce, layered with MORE cheese. Though I now know that I mistakenly left out the parmesan, I thought the cheese sauce itself was a little bland. Maybe I just under-seasoned it. (No worries, I added the parmesan after the final layer of gruyere - it was not left out!) I could have done without the mustard, but I get why it's there given the original concept of ham being present. We used sourdough bread, which gave it a great additional flavor. 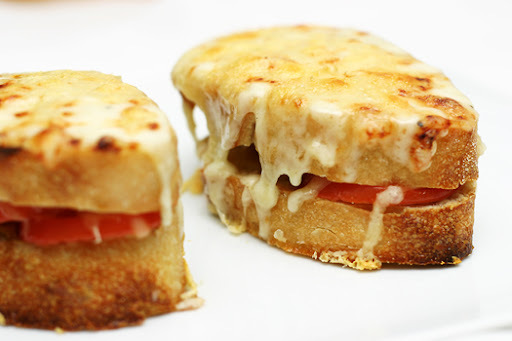 Overall, you can't go wrong with lots of cheese and bread! Very delicious! We had some ground turkey to use up, and with the weather finally getting nice, I knew my husband would be itching to use the grill. 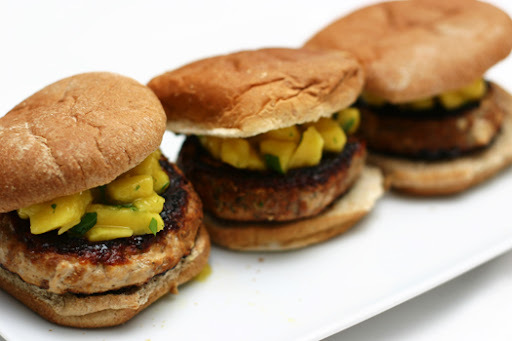 I was searching for something different than what we usually do with burgers, and I stumbled across this recipe. Cheese? Check. Vegetables snuck in there? Check. New flavor? Check. We haven't ventured much into the Greek flavoring realm, so I decided to ease us in with this recipe. I cut the recipe in half, omitted the yogurt and used one egg instead of the egg beaters. The only thing I'd change next time is to add the yogurt (I was just being lazy when I omitted it) and to increase the Greek seasoning. I thought it could have used a little more. 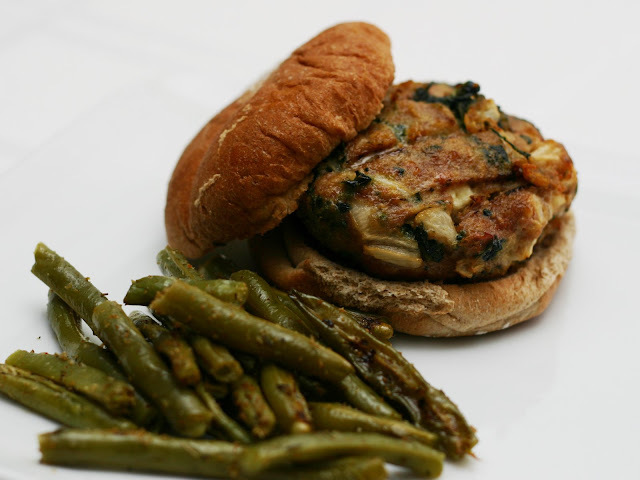 Overall, it's a great burger recipe and I'm excited to make them again! Combine all ingredients. Form 8 equal sized patties. Cook over medium heat, until no longer pink. My husband doesn't eat ham, so the typically Easter ham is a no-go in our house (I'm not really saddened by this). Instead, I made a turkey dinner. Since I got an 11 pound turkey for two people, there were plenty of leftovers. Luckily, my Better Homes and Gardens cookbook had a great casserole recipe for leftover turkey! I had to omit the bacon and pepper, used brown rice instead of white, used canned artichokes, and used a homemade substitute for the canned cream of chicken soup. The casserole turned out fabulous, and will definitely be a favorite use for leftovers in the future! I had enough to make two, and froze one for an easy meal on a busy night. I am realizing now that this does not photograph well. But, it's too good to leave out. So here you go. 1. In a large skillet cook carrot, sweet pepper, and green onion in hot butter over medium heat until carrot is crisp-tender. Remove from heat. 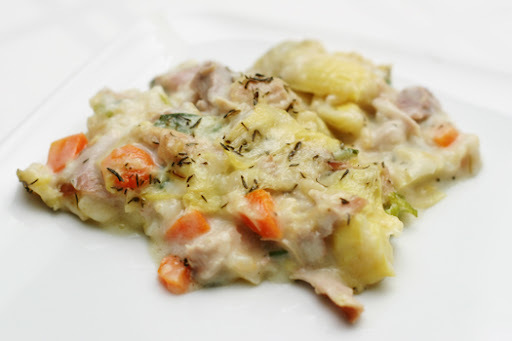 Stir in soup, artichoke hearts, turkey, rice, mozzarella cheese, milk, thyme, and bacon. Transfer turkey mixture to a 2-quart rectangular baking dish. Sprinkle with Parmesan cheese. 2. Bake, covered, in a 350° degree oven for 20 minutes. Uncover and bake about 20 minutes more or until bubbly. Let stand for 10 minutes before serving. Makes 6 servings. 3. Make-ahead directions:Prepare as above through step 1. Cover and chill for up to 24 hours. Bake, covered, in a 350° oven for 30 minutes. Uncover and bake about 20 minutes more or until bubbly. Combine all ingredients except butter together and store in airtight container. To use, mix 1/2 cup dry soup mix with 1 1/4 cups water and cook until thick; add butter. This is equal to one can cream soup. The mix makes enough to equal 9 to 10 cans. For cream of mushroom or celery soup, add chopped sauteé mushrooms or celery along with the butter while cooking. Ever since we moved here and started going to a fabulous grocery store, I've been eyeing their selection of fresh tomatillos. I desperately wanted to make something, anything, with them. They turned out to be a fabulous addition to white chicken chili, so I after that I was ready for recipe #2. Flipping through my Better Homes and Gardens cookbook, I found their recipe for Chicken with a tomatillo salsa and put it on the menu immediately! I think for next time, some queso fresco layered just at the end of cooking would made a great addition to an already fabulous dish! 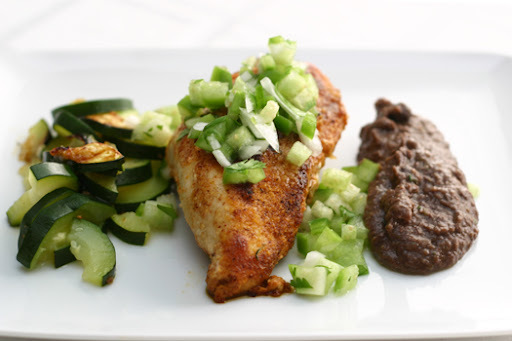 We served with some mashed black beans and sauteed zucchini. Yum! Source: Better Homes and Gardens, New Cookbook: Bridal Edition, p 426. 1. In a resealable plastic bag combine cornmeal, flour, chili powder, salt, and pepper. Add chicken pieces, a few at a time. Seal bag; shake to coat. 2. In a large skillet cook chicken in hot oil over medium heat for 8 to 10 minutes or until chicken is no longer pink (170 degrees F), turning once. 3. Meanwhile, for salsa, coarsely chop tomatillos (you should have about 1 cup). In a small bowl stir together tomatillos, cilantro, onion, lime juice, and jalapeno pepper. Serve salsa over chicken. This pan seared shrimp recipe from Cook's Illustrated sounded tasty, easy, and quick. And, it was! I ended up doubling the sauce since I wanted to combine it with some noodles. It was just the right amount and we really enjoyed the flavors. 2. Heat 1 tablespoon oil in 12-inch skillet over high heat until smoking. Meanwhile, toss shrimp, salt, red pepper, and sugar in medium bowl. Add half of shrimp to pan in single layer and cook until spotty brown and edges turn pink, about 1 minute. Remove pan from heat; using tongs, flip each shrimp and let stand until all but very center is opaque, about 30 seconds. Transfer shrimp to large plate. Repeat with remaining tablespoon oil and shrimp; after second batch has stood off heat, return first batch to skillet along with sauce mixture and toss to combine. Cover skillet and let stand until shrimp are cooked through, 1 to 2 minutes. 3. 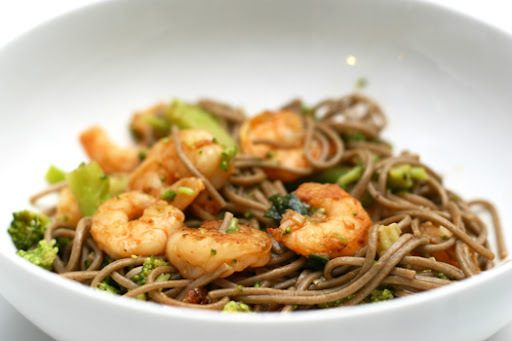 Add cooked soba noodles and steamed broccoli along with remaining sauce. Toss to combine, then serve. -In small bowl, combine thyme, salt, garlic, onion, paprika, pepper, allspice, ginger and set aside. -Divide ground chicken into four 1/4 lb rounds. Shape rounds into 1/2 inch thick patties (about 5 inches wide). -In high sided dish or airtight storage bag, combine soy sauce, vinegar, and brown sugar. -Mix to dissolve sugar into liquids. 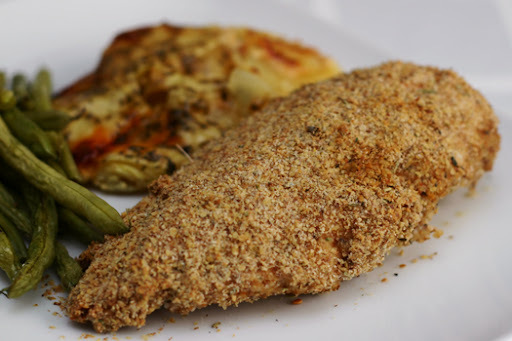 -Coat both sides of chicken patties with spice mixture and place into liquid. -Seal and place in fridge for about 1 hour to marinate. -Turn grill on medium high. 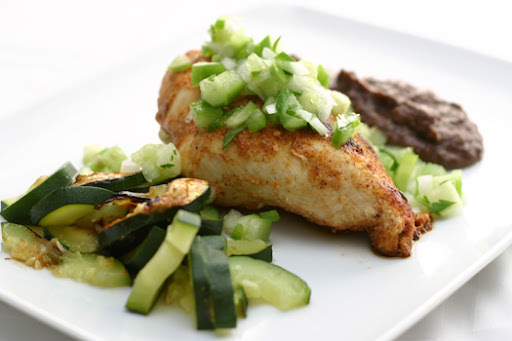 -Remove chicken patties from marinade, shake to remove excess and place onto grill. -Cook, flipping once, until cooked through, about 15 minutes. 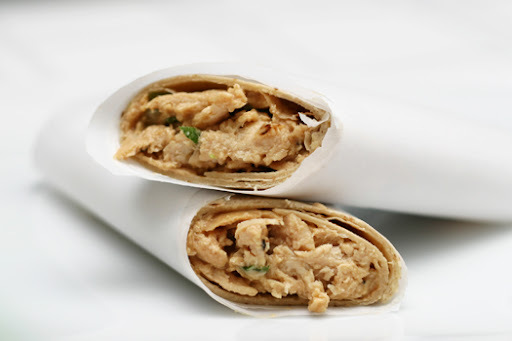 -Remove from grill and let sit, covered by foil, for 5-10 minutes before serving. -Peel and cut mango off of seed. -Cut mango sliced into 1/2 inch cubes. -In small bowl, combine mango, red onion, cilantro, mint, ginger, lime juice and garlic salt. -Mix lightly to combine thoroughly and refrigerate 15min - 1 hour before serving. As soon as I saw peanut butter in the ingredient list, I knew this would be a chicken salad my husband could get behind. Admittedly, I don't like asparagus OR red pepper, so I left those out. I did have some leftover snow peas, so I decided to add those in. After reading some reviews, it seemed like the salt in the sauce was unnecessary, so I left it out. Ultimately, we absolutely LOVED it and I can't wait to make it again... though the next time will be a little different, I don't want to use that much oil again! Update (04/28/09): I have made this a few times, replacing the oil in the dressing with 2% greek yogurt - it works great!! Place the chicken breasts on a sheet pan and rub with the skin with olive oil. Sprinkle liberally with salt and pepper. Roast for 35 to 40 minutes, until the chicken is just cooked. Set aside until cool enough to handle. Remove the meat from the bones, discard the skin, and shred the chicken in large bite-sized pieces. Blanch the asparagus in a pot of boiling salted water for 3 to 5 minutes until crisp-tender. Plunge into ice water to stop the cooking. Drain. Cut the peppers in strips about the size of the asparagus pieces. Combine the cut chicken, asparagus, and peppers in a large bowl. This comes from a recent issue of Everyday Food magazine. 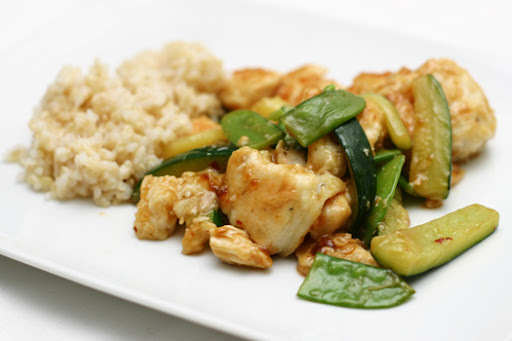 Our Chinese fake-out is usually limited to Kung Pao Chicken, since it's my husband's favorite, but I thought I'd give this recipe a whirl for something different. I'm not sure I've ever had General Tso's chicken from a restaurant, so I probably and not the best one to right a review. Regardless, we loved it! It's a light sweet sauce with a good spicy kick. I added zucchini sticks to mine for a little vegetable variety. The other reason I wanted to try it was to test drive the egg white batter technique, and ultimately I thought it was easy and worked well. I'll definitely use that in other recipes. 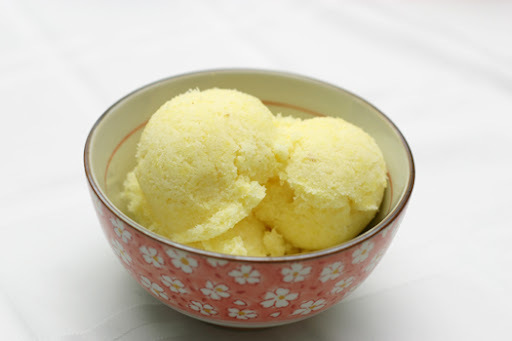 I've definitely been on a sorbet kick lately, and thought pineapple would be a good one to make next, since pineapple is my favorite fruit! This was probably the easiest one to make, and SO good! It's very refreshing, and though I only had vodka on hand, rum would be great in it as well! Combine water and sugar in a small saucepan, heat until the sugar dissolves. Peel and core the pineapple, then cut the fruit into rough chunks. Puree the fruit and sugar syrup in a blender of food processor, then pour into a bowl. Stir in the vodka or rum. Chill for at least 4 hours, then freeze in an ice cream maker. For our three days in Florence, Italy, it was clear that an afternoon gelato was what all the cool kids (and adults) were doing. Who was I to go against the tide? 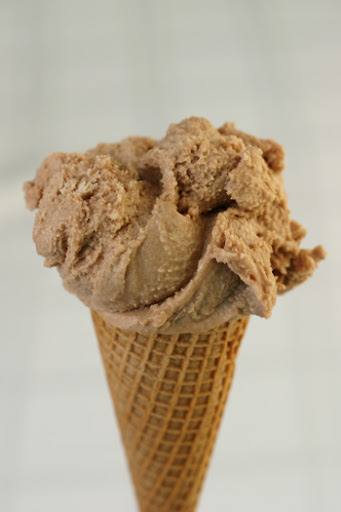 I had the same combo every day: bacio e stracciatella, or chocolate hazelnut and chocolate chip. Now that we are back home, I am craving my favorite: bacio. Lucky for me, I only need to turn as far as the Food Network and Giada De Laurentiis to bring back that wonderful experience. In a saucepan combine the milk, cream, and 1/2 cup sugar over medium heat. Cook until the sugar dissolves, about 5 minutes. Meanwhile, in a medium bowl whip the egg yolks using an electric mixer until the eggs have become thick and pale yellow, about 4 minutes. Mix in the sweetened condensed milk. Pour 1/2 cup of the warm milk and cream mixture into the egg mixture and stir. Add this mixture back into the saucepan. Cook over very low heat, stirring constantly, until the mixture becomes thick enough to coat the back of a wooden spoon, about 7 to 10 minutes. Place a strainer over a medium bowl and pour the warm custard mixture through the strainer. Stir in the vanilla, liquor, and hazelnut spread until it dissolves. Chill mixture completely before pouring into an ice cream maker and follow manufacturer's instructions to freeze. To serve, scoop gelato into serving bowls and top with hazelnuts. My new breakfast habit is making my own egg sandwiches in the morning. Now that I have discovered you can cook (cracked) eggs in the microwave, an egg breakfast during the work week became much more feasible. 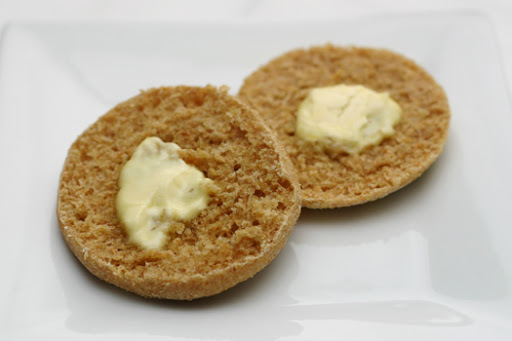 I wanted to see if I could make good english muffins at home, so I had control over the ingredients, size, etc. I found a number of recipes that used shortening, which isn't exactly the (healthier) direction I want to go. Then I stumbled upon a recipe that uses egg whites! I was intrigued and decided it was worth a shot (don't they look good?!). I made some alterations in the flour. It calls for 4 cups of bread flour, but I went with 1 cup bread flour, 1 cup whole wheat flour, and 2 cups whole wheat pastry flour. Since the pastry flour has a lower protein content than the bread flour, I added a little protein powder and wheat germ to make up a little of the difference. In a large bowl pour in lukewarm ( 110F ) water. Add instant yeast, baking soda and 2 cups of bread flour. Mix till smooth. Allow to sit for 5 minutes uncovered. In the meantime, add egg white into a separate bowl and beat with an electric mixer. You want them to become stiff and moist. Once the egg white have formed stiff peaks; add to dough batter. Using a rubber spatula fold in egg whites till incorporated into the batter. Start to add in the rest of the flour, a 1/4 cup at a time. After the first 1/4 cup mix in salt. When the mixture becomes to hard to mix in the bowl. Pour out onto a flat surface. Knead for about 5 to 6 minutes till it becomes smooth and silky. Add a little oil to a clean bowl and place the dough into the bowl. Turn dough over till all sides are very lightly coated. Cover with plastic wrap and allow to rest till double in bulk, about 1 hour. Afterwards, pour out onto a flat surface. Press to release some of the air from the dough. Using a rolling pin roll out to a 1/2 inch thick. Allow dough to rest for 3 minutes to relax. Using a 3 inch cookie cutter, cut out circles. Place the cut out pieces onto some cornmeal. When you have left over dough just gather together and cut out a few more circles. Sprinkle the tops with more cornmeal. Cover with plastic wrap and allow to rest for 45 minutes. 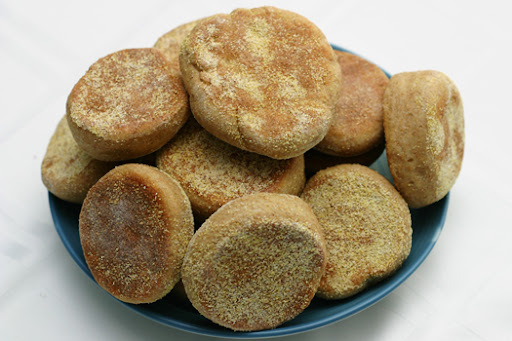 About 5 minutes before you are ready to cook the english muffins turn on your griddle or fry pan to 350F or medium heat. Spray with a little oil spray and once the griddle is hot. Place the muffins on and fry. If you are using a fry pan you may only be able to fry 3-4 at a time. Fry on one side for about 4 minutes. Then turn over and fry for another 4 minutes. Do this once more to a total of 16 minutes.